Are you an attorney thinking of starting your own solo practice? Or maybe you are someone who needs legal advice as you start your own business? 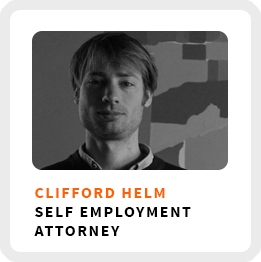 Either way, Clifford Helm is going to help you out! I like to think of him as a self-employment attorney because he helps get small businesses off the ground and growing. Probably for the same reason as many of his clients, he decided to do out on how own because he wanted to design his own work. He wanted to choose the clients he would serve and how he would serve them. 1) How to design your work based on your needs and values. 2) The tactics he uses to find new clients including masterminds, mentors and referrals. 3) How he uses “stubborn flexibility” to guide the development of his business. Ideal work environment: Moving between different locations. Regains focus by: Music or finding a place to work where he is able to ignore everything around him. 90-day business goal: Working on a new project not exclusively related to his law practice. 1) “Who” and “What” are the two most important questions for choosing a legal entity. Who am I working with? What am I selling? These questions provide the basis for how you will structure your business. 2) Determine how you are going to raise money from investors if your business requires outside investment.